This is a nice antique, 14" adjustable pipe wrench, marked "14 USHCO LAWSON U.S. HAME CO. BUFFALO N.Y. U.S.A. PAT. DEC.14.20 OTHER PATS PEND". This is a rare pipe wrench with a angled knurl slot patent that used gavity instead of moving jaw spring load to keep the moving jaw in it's proper position. Works good! In good+ condition with very little wear, no rust, very good jaw teeth, knurl thread and jaw gears. The jaws show very little wear overall. We note a few small hammer dings on the the handle, and the handle is slight bend on it's width, not noticeable if laying flat or hanging on a wall, otherwise a very carfully used wrench by the looks of it. Measures 13" long (completely closed) even though it is marked 14" on the wrench, and the jaws are 3/4" thick. A very rare and collectible patented antique pipe wrench! 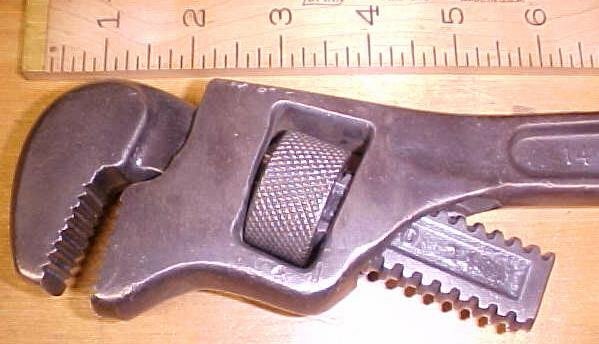 Items Similar To "Lawson Pipe Wrench U.S. Hame Co. 14 inch"
Trimont Trimo #18 Pipe Wrench 16.5" Ca. 1900 U.S.A.
Trimont Trimo #14 Pipe Wrench 13" Ca. 1900 U.S.A.